As we specialise in the repair and overhaul of aircraft piston engines, we unfortunately see some of the more dramatic engine failures. Over the years, one of the most common causes of catastrophic engine failure that we have seen is loss of the engine oil, and the subsequent loss of engine oil pressure. When we examine the circumstances of these engine failures, a common scenario that we hear from the pilot, is that they noticed a drop or reduction of the engine oil pressure, but as the engine seemed to be operating normally, they continued flying, not recognising the seriousness of their situation. In some instances, the pilot thought that all that had happened was the oil pressure gauge had stopped working. This could be a fatal mistake. Most of the oil starvation engine events that we have seen are caused by the loss of the oil from the engine. It is the low oil level that then causes the low oil pressure. Sometimes as the quantity of oil remaining in the sump gets very low, you might see a slight increase in oil temperature. The quantity of oil in the engine is not monitored during flight. The first indication of a low level problem is normally a reduction in oil pressure, as indicated by the oil pressure gauge. Some problem causes an oil leak from the engine. The oil leak may be relatively slow, such a leak from a part of the engine where the oil is not under pressure, such as a leak from pushrod tube, or a rocker cover gasket, or the oil can leak at a much faster rate from a part of the engine where oil is supplied under pressure i.e. from a ruptured oil hose, or from a failed oil filter seal or similar. Regardless of the cause of the oil leak, once the engine has lost enough oil, the oil level in the sump falls below a critical level. Without sufficient oil in the engine, engine failure may be imminent unless the loss of oil, and loss of oil pressure is recognised by the pilot, and appropriate action taken. If the amount of oil in the engine sump drops below a safe level, the pickup for the oil pump will not be submerged in oil, and air instead of oil will be drawn into the oil pump. Once air instead of oil is being sucked into the oil pump, critical parts of the engine, including the engine bearings, will no longer receive the vital oil lubrication that they require to operate. 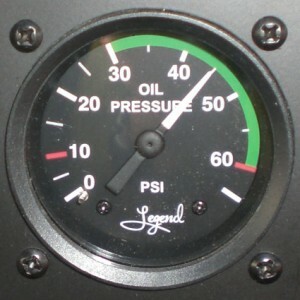 If air is sucked into the engine oil pump, the supply of pressurised oil to engine bearings and other internal components becomes aerated and the engine oil pressure indication will fluctuate and drop . This is a key warning sign. Pilots need to know that any appreciable fluctuation or reduction of oil pressure on the oil pressure gauge is cause for immediate action. Depending on the design of the engine, and in particular the design of the sump and oil pick-up, it may only need a very small further loss of oil from the engine until the oil pump is mainly drawing air and very little oil. Once this happens the indicated oil pressure drops to near zero and if the engine continues to be operated, failure is imminent. Initially, while the engine oil pressure is low or fluctuating, the engine may appear to be operating normally. This may lead the pilot to think that there is an error with the oil pressure gauge or sensor, and that the engine will continue to operate relatively normally. This can be a fatal error of judgement on the pilot’s part. What is really happening within the engine, is that critical engine parts, such as, the main and connecting rod bearings, are no longer receiving the vital lubrication that they require. As the oil pressure continues to fall, the amount of lubricating oil supplied to the bearings becomes less and less. With low or no oil pressure, the flow of oil to main and connecting bearings and other critical engine parts essentially stops. The main and connecting bearings only have the residual oil between the bearing shell and crankshaft journal to provide lubrication. But with no oil flow, this residual oil quickly heats up, and loses viscosity. That is, the oil becomes thinner, and shortly the thin oil film between the bearing and the journal can no long withstand the applied loads. When the oil film can no longer withstand the applied load, metal to metal contact occurs between the bearing and crankshaft journal. Once this happens, the situation runs out of control very quickly. The friction and forces from the metal to metal contact of the bearing and crankshaft journal results in the rapid and complete destruction of the bearing shell. This is accompanied by a rapid temperature increase of the crankshaft bearing journal and surround areas such as connecting rod big end. Once the steel is red hot and weakened, either the crankshaft, connecting rod, or connecting rod bolts are no longer able to withstand the applied loads and something breaks. Normally it is either the connecting rod bolts or the connecting rod itself that break under such adverse conditions. Just depending on what breaks first, the engine may just stop, or the engine may continue to operate in a seriously compromised state for a short period before something else breaks. The metal contamination form the destroyed bearings, and the flailing of broken connecting rods within the engine causes enormous internal engine damage. Not much can be savaged from an engine that has failed in this manner. At cruise power settings, I would suggest that the typical time frame between when the first fluctuation or reduction of oil pressure occurs (caused by the aeration of the oil) until the catastrophic engine failure occurs is somewhere in the range of 1 – 10 minutes. So, what should you do, if you see any abnormal fluctuation or reduction of oil pressure. If you are in a single engine aircraft you need to make a forced landing as soon as you can. If you try to press on to reach the next runway/airfield/airport you run the risk of a catastrophic engine failure before you reach the next runway/airfield/airport. If you are in a twin engine aircraft you need to land at the nearest available suitable runway/airfield/airport. Be prepared for single engine operation as the propellers on most twin engine aircraft will automatically feather when oil pressure is lost, in which case the engine can not deliver any useful power or thrust. In either case, to prolong the operation of the engine, reduce power. If you are in a situation where the power can be reduced, do so. With low oil pressure, the engine will operate for a much longer period at idle power than it would at cruise power. You want to try to avoid catastrophic failure of the engine because once the catastrophic failure has occurred you do not have any more options. If the engine is operated at a low power setting, the engine may retain enough integrity to operate for a brief period at a higher power setting to give you the opportunity to avoid an obstacle while trying to land or select a better forced landing area. After landing, you will need to have the engine inspected to determine the cause of the engine oil loss, and low engine oil pressure. If it is found that the engine has been operated with oil below the minimum safe level, and/or low oil pressure, the engine will need to be stripped and thoroughly inspected before it can be returned to service. Do not be tempted to correct the oil leak, re-fill the engine with oil and continue operation. Damage to the bearings may have occurred that is not immediately apparent. If the bearings have been damaged, the engine could fail on the next flight, or in twenty flights time. Unless the engine is stripped and inspected you can not be confident that no damage has been done to the engine.